There’s no shortage of predictions about how the Internet of Things (IoT) is going to revolutionize life as we know it. Everything from manufacturing to your coffee pot will be impacted by the influx of sensors and data in the coming years. Nowhere, perhaps, will the IoT have a bigger impact than the healthcare industry. According to Deloitte, within five years, the majority of clinically relevant data will be collected outside of clinical settings. The IoT, where devices connect directly to data and to each other, is rapidly becoming the new normal. Wireless, sensor-based systems are already at work today and the healthcare industry is moving full-steam ahead towards new products and innovations. A report from MarketResearch.com states the healthcare IoT market is poised to hit $117 billion by 2020. More data – Advances in sensor and connectivity technology are allowing devices to collect, record and analyze data that was not previously accessible. In healthcare, this means being able to collect patient data over time that can be used to enable preventive care, allow prompt diagnosis of acute complications and promote understanding of how a therapy is helping improve a patient’s health. More reliable results – For some, just the thought of going to the doctor is enough to induce beads of sweat and clammy hands. IoT helps to avoid skewed results from what’s often called “white coat fright.” The panic many feel when entering a doctor’s office can have an impact on blood pressure, heart rate readings and other tests. Wearable devices connected to the IoT provide results collected over a longer period, which could prove more accurate than results based on a single moment in time. Improved outcomes – The shift towards a more fluid and relevant way of tracking overall patient health over time will offer a more holistic view of the patient. Wireless, sensor-based systems are already at work today, gathering patient medical data that was never before available for analysis and delivering care to people for whom care wasn’t previously accessible. Fewer errors – The ability of devices to gather data on their own removes the limitations of human-entered data—automatically uploading the data medical professionals need, at the time and in the way they need it. The automation reduces the risk of error. Fewer errors can mean increased efficiency, lower costs and quality improvements in just about any industry. But it’s of particular need in healthcare, where accuracy can be the difference between life and death. Soon, XYZLife, Kinpo Group’s advanced healthcare product brand designed for the medical/consumer market, will introduce breakthrough wearable IoT technology in the form of a medical-grade necklace and a shirt designed to be worn under clothing. XYZ’s Bio Sensing technology monitors key vital signs and is particularly designed for individuals with a history of heart problems. With these portable devices, users can record and monitor heart rates, breathing rates and EKG anytime, anywhere. XYZ’s innovations will offer a range of customized information and reports, available via a mobile device, which can be sent directly to your medical professional or emergency contact. With these portable devices, the product is constantly monitoring and alerts you if there are abnormal readings. Recording becomes easy and personal health can be monitored in a more effective and systematic way. IoT will continue to flourish in healthcare for the foreseeable future. Sooner than many imagine, we will likely reach a point where your car, clothing, devices and doctors work together so seamlessly to provide a view of overall health that it will be hard to imagine a time without the IoT. This entry was posted in 未分類 on 2016-07-22 by xyznkgairfoil. This month, students, teachers and adults are gearing up to create, innovate and tinker in celebration of National Week of Making (June 17- June 23). This year’s festivities continue the initiative that began in June 2014 when President Obama hosted the first-ever White House Maker Faire and issued a call to action that “every company, every college, every community, every citizen joins us as we lift up makers and builders and doers across the country.” Last year, he built on the single event by proclaiming a National Week of Making and inviting people of all ages to hold events around the country celebrating ing enuity, inspiring creative problem-solving, and supporting opportunities for those from all backgrounds to tinker and make. Since our inception, XYZprinting has put a spotlight on making and paved the way for hands-on, creative and educational activities, such as 3D printing and robotics, to be affordable and accessible to all. Our recent COMPUTEX Taipei 2016 award win for our $269 3D printer, the da Vinci Mini, recognized the innovation and affordability of our products. And in January, we received the CES Editors’ Choice Award for the Mini. Below are a few other products that can be used to bolster creativity and delight makers of all ages during the National Week of Making. XYZmaker and XYZmaker lite: XYZmaker, a 3D modeling application, and XYZmaker lite, the Windows OS, Android and iOS mobile apps, are the perfect solutions for young designers to edit projects intuitively in the classroom. Both provide a solution and service to expedite the process from design to print. XYZ STEAM: An online curriculum exchange program best-suited for STEAM educators to incorporate 3D printing seamlessly into the classroom. Curricula consist of downloadable 3D printing models, assembly instructions, photos, videos and operation instructions that stimulate learning. da Vinci 3D Pen: Our 3D Pen is a borderless imagination come to life. The PLA filament gets pushed through the tip of t he pen so that it comes out melted, but cools quickly so that users can draw 3D objects in minutes. The 3D Pen doesn’t require a computer or software to operate and is great for DIY and craft projects. It’s currently available for pre-order for $49 along with the da Vinci Jr. 1.0 Pro 3-in-1. We look forward to hearing the stories of the countless leaders, innovators, entrepreneurs, and educators, in local communities, who will use this week to bring products and inventions to life. Check out our gallery to see how everyone from students to professionals are getting creative with the help of 3D printers and then upload your own photos during the National Week of Making. This entry was posted in 未分類 on 2016-06-08 by xyznkgairfoil. Southeast Asia is increasingly becoming a popular place for major brands to make gadgets, widgets and all things electronic. Analysts have attributed the increase to the high-quality labor available in the region coupled with lower costs and more favorable economic climate compared to China. Although this global market shift is relatively new for many electronics manufacturers, New Kinpo Group (NKG) has long predicted additional EMS growth will be fueled by the Southeast Asia market. This early vision and strategic investment has allowed NKG to develop a vast, stable supply chain in the region. Although the industry is notoriously slow and often belabored, NKG forecasts more companies will begin to shift operations to the region. Below are three reasons Southeast Asia will continue to grow as a strategic location for electronics manufacturers. Middle class growth – Southeast Asia’s middle class is diverse, confident in the economy and growing more affluent by the day. In 2012 there were an estimated 190 million people in Southeast Asia who could be defined as middle class. According to Nielsen, that number will more than double by 2020, to 400 million people. This will translate into an increased demand for consumer goods. Infrastructure – Global shipping expenses have made it crucial to look for more effective production sites and Southeast Asia is becoming the center of gravity. As a result, the company’s international customers are able to capitalize on our robust infrastructure to better serve local customers. With our extensive knowledge of local markets, NKG is able to vertically integrate stable supply chains and keep our design team close, drastically improving delivery time for our customers. Modern technology – The increasing desire for mobility and productivity coupled with access to more disposable income will continue to drive overall demand for consumer electronics products. IoT also represents a major opportunity for the region to foster innovation that would create a positive impact not only for consumers and businesses, but also in the education field. Based in Taiwan for more than 40 years and in Southeast Asia for 24 years, NKG continues to invest throughout the region in order to offer customers greater flexibility, lower costs, faster delivery times, and world-class product quality. Most recently, NKG opened a new factory in the Philippines. This highly-automated, vertically-integrated factory employs more than 8,000 skilled workers dedicated to consumer product manufacturing. Watch the video from our recent grand opening celebration below. With manufacturing sites located strategically throughout the world—including not only Southeast Asia, Thailand, the Philippines, and Malaysia, but also the U.S., Brazil and Mexico—and a vertically integrated model, NKG will continue to achieve lower manufacturing costs and greater efficiencies than other global EMS/ODM companies who are just now realizing the opportunity this vast and environmentally diverse region has to offer. As NKG strategically expands into new markets to best meet the needs of our customers, we expect other manufacturers will continue to follow the footprints along the path we’re forging. This entry was posted in 未分類 and tagged Manufacturing on 2016-04-29 by xyznkgairfoil. As our world becomes increasingly more connected, we will find we need to shift our perspective on the products we manufacture and buy. Not only are we connecting with more things, but more things will be initiating connections with us—and with each other—as part of the Internet of Things (IoT). Before a material even takes its final shape, it will know and display the truck, train or ship that should transport it. On the truck, the product furnishes a GPS navigation map for the palette on which it rests to direct the driver to the specific dock where it and its “companions” should be unloaded. Upon reaching the warehouse, the information in the product material directs robotic handling equipment to the bin where it should be stored. The location already has been determined and programmed early in the assembly process. At the consumer’s home, the product is constantly monitoring the activity of the R&D team who created it and knows immediately when an upgrade is available, downloading the new software remotely on its own, once approved. Products will use wear conditions and internal analysis of components to predict when they will break down—and file a warranty claim on behalf of their owner. If a software fix will take care of the repair, the product will download the fix seamlessly. The IoT might justifiably recast the Internet of Things as the Internet of Thinking, as products and the materials from which they are made manage their entire lifecycle on their own, based on their intelligent evaluation of their changing environment. This new capability will offer new opportunity as we reshape and reevaluate the way we think about the supply chain. This entry was posted in 未分類 on 2016-03-03 by elizabethvanstee2. CES 2016 was a massive, whirlwind of an event with thousands of pieces of new technology, old technology and reimagined technology on display. With so many gadgets competing for attention, New Kinpo Group subsidiary XYZprinting was proud to pull ahead of the competition and have new products, including the da Vinci Mini, recognized by Reviewed.com and USA Today as a “Editor’s Choice,” by Tom’s Guide as a “Top Pick” and by TWICE as a “Best Pick” for the 2016 show. These additional distinctions continue momentum from last year where XYZprinting earned a Top Tech of CES designation and PC Magazine’s “Best of CES” award for its 3D printing technology. 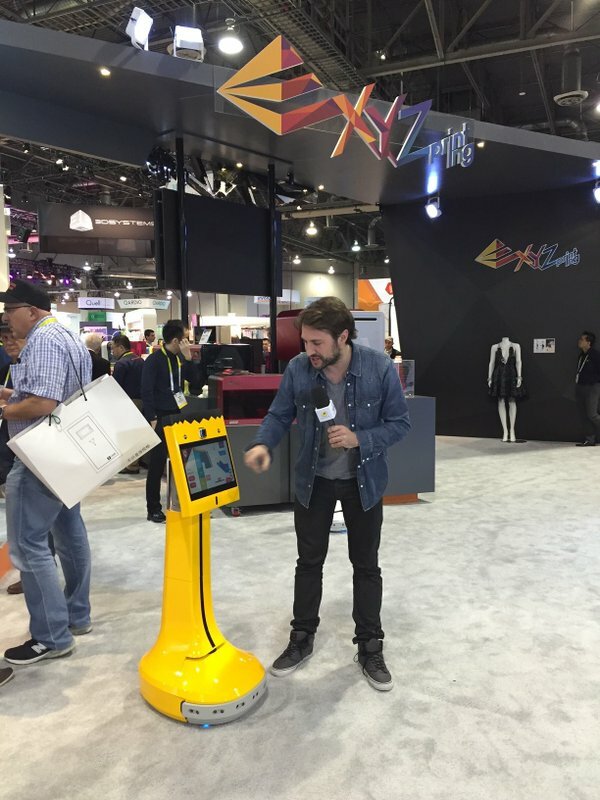 Beginning with CES Unveiled, show attendees and media members visited the booth to see how New Kinpo Group is breaking down technology barriers with the introduction of several easy-to-use devices that deliver innovative experiences to consumers. Since last year’s show, New Kinpo Group has become the world’s largest provider of 3D printers, accounting for 22 percent of all the world’s shipments in this category. We’re continuing our expansion into new categories and new regions with a mission to enable the masses to experience the benefits of advanced technology. One such area of significant expansion is robotics with the addition of XYZRobots. At CES, there was 71 percent more space dedicated to robotics, compared to 2015, making it a hotbed of activity on this front. Together with XYZPrinting, XYZRobot showcased an array of intriguingly advanced robots, 3D printers and electronic wearables. The new products represent significant innovations in capability and compactness that will be available in the global marketplace this year. The da Vinci Mini, which is 70 percent smaller than the da Vinci Jr. home printer. Yet it maintains the same build size of 5.9 x 5.9 x 5.9 inches. It serves as a desktop 3D printer with a one-button printing process that’s as simple to use as a coffeemaker. 3D pen that pushes melted material through its tip to enable artisans to draw 3D objects in minutes without a computer or software. With no restriction on print size, the pen can create whatever image is in the designer’s mind. It also can be used to repair objects or add decoration. Nobel 1.0A, a highly accurate and affordable professional-grade desktop 3D printer. It uses a photosensitive resin and a UV laser to obtain a print resolution of up to 25 microns. It offers a maximum build size of 5 x 5 x 7.9 inches, larger than any other stereolithographic 3D printer can build. BC1, a long-term, continuous ECG monitor that integrates into consumers’ clothing or as a wireless patch. With an anticipated Q3 2016 release date, the BC1 system provides users with seamless and accessible information to their body’s data without time or place limitations. The product will be retailing for $150 which includes the shirt. W-01, a modularized, wheeled, edutainment robot capable of showing expressions and human-type movements. The personal robot serves as an educational tool for individuals learning how to create animations for LEDs by changing the expressions in the robot’s eyes. The interactive robot, equipped to play voice or music, is built with seven servo motors in its upper body and incorporates a link tracking sensor for maze-design competitions. It employs a laser and ultrasonic sensors to avoid obstacles when moving. W-01 can carry objects that weigh as much as 300 grams (2/3 of a pound). Smart Service Robot for use in businesses. The new robot has auto-navigation, mapping and monitoring capabilities, can avoid obstacles and lets people interact with others in remote locations as if they were in the same place. It offers telepresence through a 14” touch panel. In Taiwan, a major home products chain uses the Smart Service Robot as a customer service representative to guide customers to store shelves and to handle call-center functions. XYZprinting’s prosumer-grade 3D Jet is a desktop printer that sprays a photopolymer resin as an inkjet printer would, producing exceptionally high-quality prints. This innovation is particularly valuable to engineers, toy makers, entrepreneurs and project designers who need to build high-quality prototypes. NKG growth will continue with the addition of these new products as well as other innovative launches planned for 2016. Over the past year, NKG has grown to an estimated $7.9 billion USD in sales, a record for the global corporation. NKG now embraces 22 companies, 72 factories and nearly 45,000 employees. This entry was posted in 未分類 on 2016-01-25 by elizabethvanstee2. In nearly every business and government sector across the globe, robots are handily making work easier and more consistent. They help assemble cars, perform operations and explore planets. In manufacturing, robots traditionally have been assigned to large tasks that require only gross movements, like painting, picking and placing. Now, however, they are able to handle fine movements and to work literally shoulder-to-shoulder with humans on complex projects. Robots will become lighter and more portable, so that they can be used more flexibly for a variety of tasks and on multiple assembly lines. The results will be a much more agile and less expensive manufacturing infrastructure and an increased ability to customize smaller runs by moving robots around and programming them for short-term duties. Robots will become increasingly agile, able to manipulate smaller components in more complex ways. They will begin to transform the concept of “assembly” into the concept of “craftsmanship,” with much more sensibility toward fine details. Robots will become increasingly smart, able to learn to some extent from their past activity and predict work flow. They will begin to show the kinds of intelligence we see in today’s Internet, in which previous choices and actions help guide future actions toward desired goals and quality. Assembly-line robots will connect to the Internet of Things so that they will be able to request parts when supplies are low and request replacements for parts they determine are damaged before those components are installed into products. Through the Internet, robots will communicate with each other to simplify and accelerate just-in-time production. Going beyond ERP, robotic “peer-to-peer” communications will enable an assembly plant robot to notify a supplier robot when a particular work cell has deviated from the planned production schedule or a supplier to tell the assembly plant that it has run into problems, all in real time. Researchers currently are taking advantage of artificial intelligence capabilities in robots to train them when to say “no” to a human command. The robots are being taught to speak up when they receive a command that could be dangerous to humans or cause damage in the facility, based on logical arguments that developers are implanting in the robot’s software. If all these prospects seem impossible, remember that many of us said the same thing about the Internet and email a generation ago. Chances are we’ll come to rely just as much on robots in manufacturing as they become an essential part of the industrial infrastructure. This entry was posted in Point of View, 未分類 and tagged Internet of Things, IoT, Manufacturing, Robotics on 2015-12-17 by elizabethvanstee2. With technology products entering the market at an ever-increasing pace, every day seems like a holiday, a time to buy the latest gadget or work-saver. So the traditional holiday season becomes a time to focus even more closely on the amazing range of new tech devices becoming available, like those being offered by New Kinpo Group (NKG). NKG product design labs and manufacturing facilities are the places where “emerging technology” first emerges and where consumer trends often begin. This year, those trends favor highly affordable devices that are responsive to consumer demands for lower price points, along with the ability to customize a wide range of products. With such customization, consumers in effect are creating gifts of their own using their own technology. One remarkable development that is stimulating consumers to create and personalize products on their own is the emergence of 3D printing for homes and schools. NKG subsidiary XYZprinting produced the first affordable line of consumer 3D printers and now leads the global market in 3D printer shipments. The latest affordable 3D printing device from XYZprinting is the $199 3D scanner, which allows anyone to scan three-dimensional objects for 3D printing and customization. The scanner turns physical objects into digital replicas that can be modified in size, shape or other dimensions for 3D printing by using a computer. More customizing is on its way with tabletop, do-it-yourself robots from NKG. Teens and adults alike now can build their own humanoid robots and program them to carry out commands that can be created and edited with software available as a tablet app or through a remote control. Each of these small robots is equipped with 18 powerful servo motors, allowing for the programming of human-like movements. Consumers even can create their own designs for the robot’s armor and use a 3D printer to produce other unique parts for their robots. Wearable devices, which largely originated as technology related to sports and leisure, now are evolving more toward overall health, a more customized use that helps individuals reach personal health goals. Rock Health reports 17 percent of the U.S. population already is tracking a key health factor in a mobile app. Much of this tracking now is shifting toward wearable devices, from wristbands to smart watch. Additionally, 63 percent of those who have purchased wearables say they did so to become active, and 42 percent did so to lose weight. For youngsters, the line between learning and play always has been vague, but now the difference becomes nearly indistinguishable as they learn to make their own tech play items. XYZprinting STEAM offers an online curriculum exchange program for incorporating 3D printing into the classroom. Many youngsters will be building some of their own holiday presents—from drones and model rockets to robotic-type toys—using what they learn from these classes and employing 3D printers. For adults, the Maker Movement extends the evolution of learn/play to people who become 3D printing artisans, with new products produced cost-efficiently. In all, this holiday season will be spiced up by affordable trends and DIY devices that let anyone become a maker and that make our lives more connected. This entry was posted in Point of View on 2015-12-01 by elizabethvanstee2.